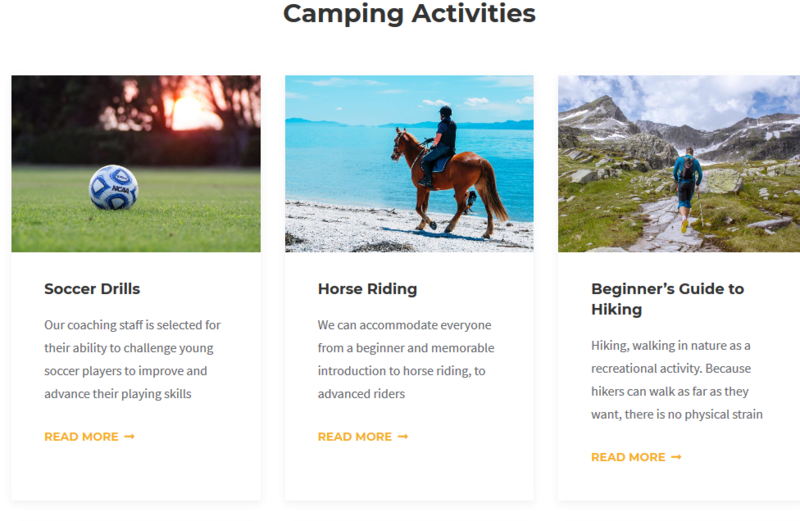 There is a good bunch of summer camp WordPress themes out there, but honestly, only a few can offer something more than just great design solutions for featuring outdoor activities. 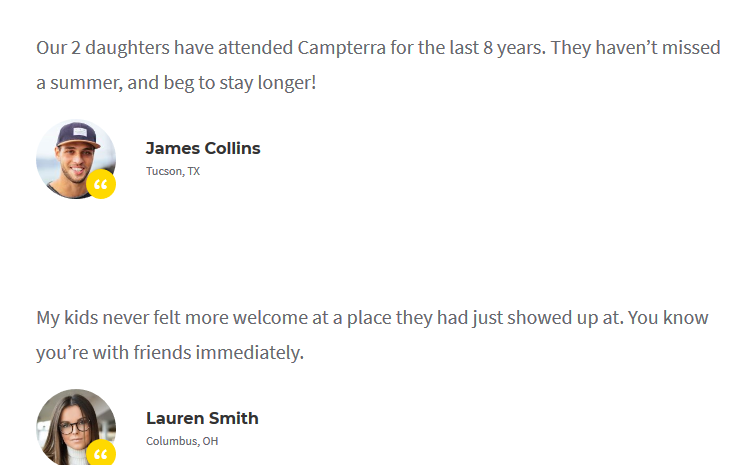 Campterra Camping WordPress theme is not a typical camp design. 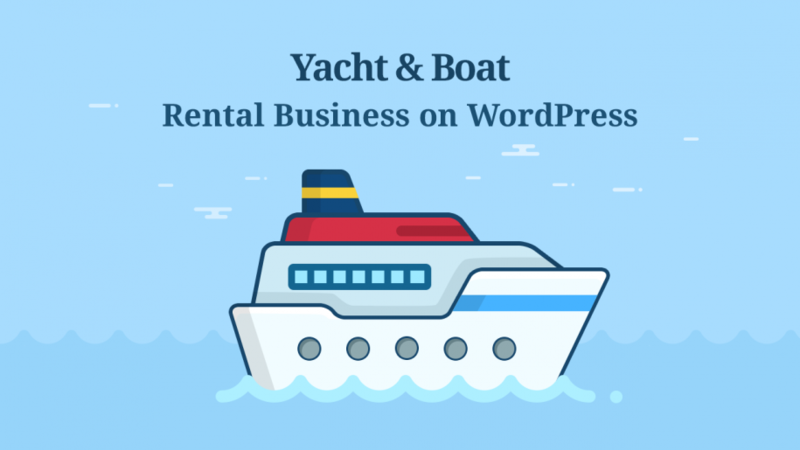 It’s a turnkey solution with the ultimate online booking system for camp units (our premium WordPress plugin that is packed for free, by the way). So if you are a campground or RV park with multiple rental sites, a small CL or a glamping site looking to make online booking real, Campterra is undoubtedly a perfect match. I’ll cover all whys in a minute. 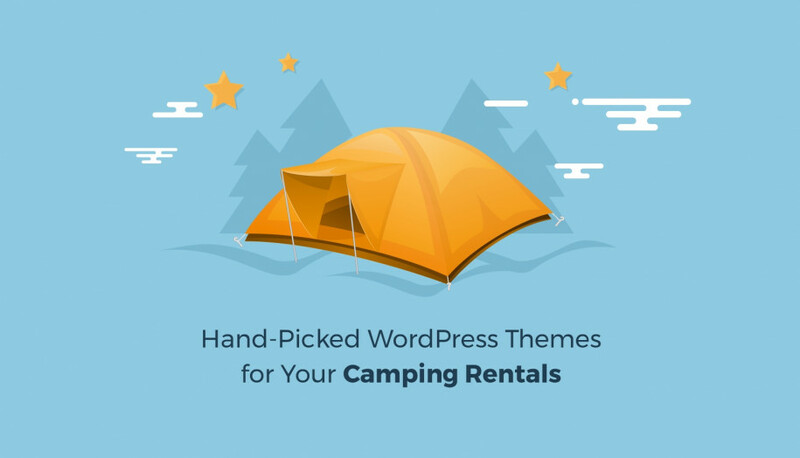 Technically, this camp WordPress theme allows you to create a directory of unlimited rental camp units of any type – pitches for recreational vehicles, tent sites, campground resort accommodations and more. To present each bookable space, you are provided with a handy rental unit editor that allows to feature any details like unit size, hookups, sleeps, view and any other piece of info you need to state. Thanks to the flexibility of the MotoPress property management system of this theme, you can feature and rent out multiple campgrounds in different locations. Let’s take a closer look at all the theme details to highlight why it can help you build an online presence desirable by Rvers and seasoned campers. The overall design of Campterra is crafted for serving a better experience to your guests. The navigation is super handy, without any sophistication. All contact info and an online booking button are placed in the header, the very upper section of the theme. According to the best design practices for campground and accommodation booking websites, this is the best (most visible) place for contact details. It can be updated in clicks in the live editor (WordPress Customizer). To skyrocket your engagement with campers from the first website landing, Campterra offers a huge full-width slider. Feel free to employ it to communicate your mission, hot deals or state who your campground is best suited for. Instant calls-to-action can help you get the most out of this section. Now, even more good news. It’s not that demonized type of slider that can kill your website performance. This slider is absolutely lightweight since it’s created with native WordPress functionality (doesn’t require extra plugins) – the classic featured images of the posts serve as the slider images while texts are a simple post content. We’ve made all possible to ensure the header slider is stunning, useful and doesn’t affect the website load times. For quick and easy campsite bookings, campers can check the availability of your campground units even without manual scrolling through all units in the directory. To enable this functionality, use the search availability widget, powered by the MotoPress Hotel Booking plugin. It’s a real-time system for unit bookings. 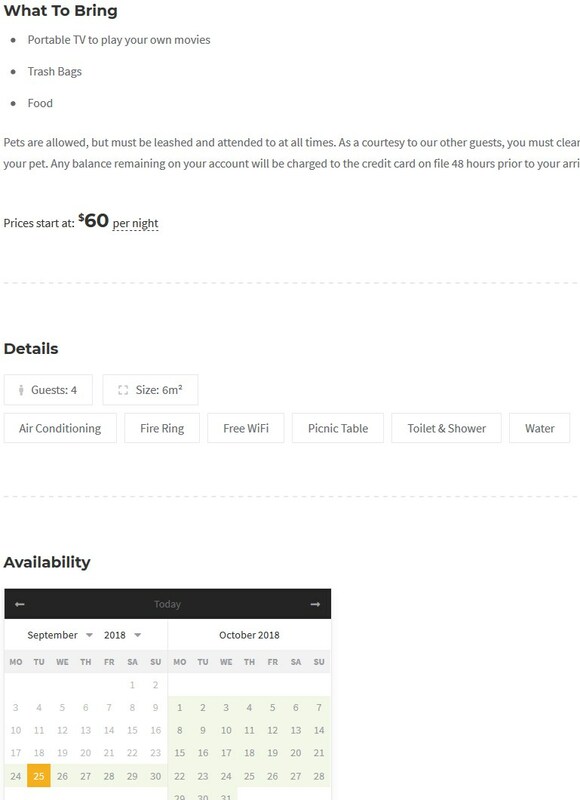 It can function without any manual control (for example, booking confirmation upon a payment or email confirmation) or the website admin can go through each booking manually. It’s up to you. ﻿ As you see, quick and easy bookings for your guests are guaranteed! Offer them bookings from the comfort of their homes and present yourself as a modern and professional brand. 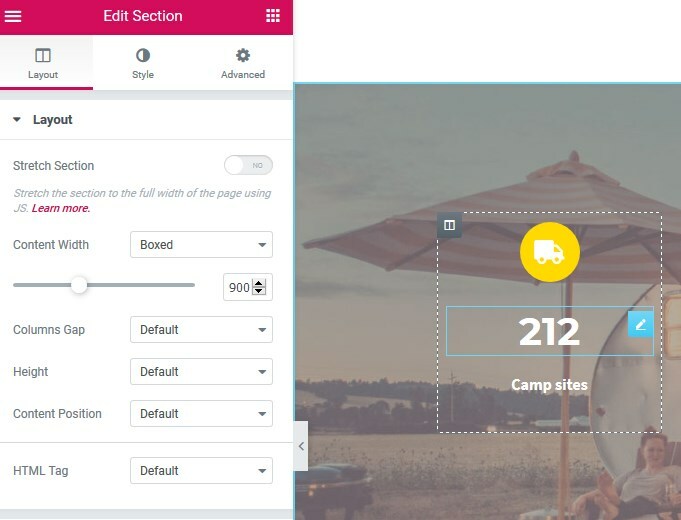 The intro section allows you to briefly describe your campground and add several media files like image and video to impress campers with your space. One of the biggest sections is devoted to the ”Features” of your campground – you can actually use this space to list the main benefits, “house rules”, services, the size of trailers allowed, hookups and more, depending on your business niche. It’s bold and catchy allowing you to literally ”answer” all prospects’ questions about your campsites. Use some informative images (preferably with the transparent background) to visualize the data. It should look really yummy! This section, as well as the majority of other theme sections, can be easily customized in a live Elementor editor. Texts, icons, images, backgrounds – everything is tunable without any tech expertise. Next, of course, your campsites and their rates. They are structured in a compact list letting customers see all details, pricing and the gallery of images. When they hit “Book”, they are redirected to the page where they can view the full information about the unit, the availability calendar and can check availability of this particular unit. All of the units (tents, RV pitches, cottages, etc.) 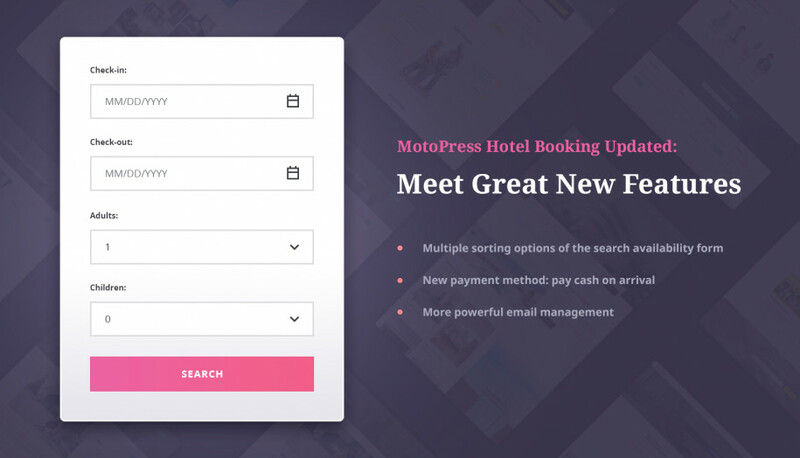 are added via the MotoPress Hotel Booking plugin. You can designate the type of each unit, set flexible rates, size and any other info. 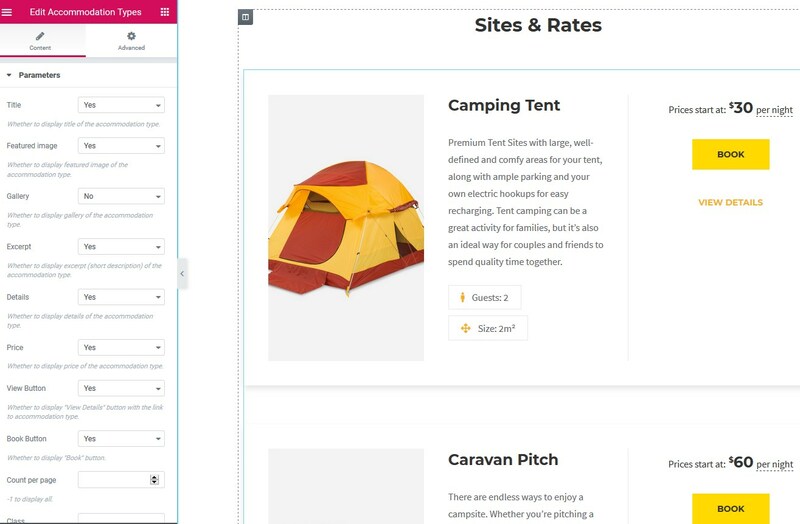 Camp bookings can be safely and automatically processed online – through PayPal, 2Checkout, Braintree, Stripe and Beanstream/Bambora for free or via location-specific gateways with a help of a premium WooCommerce add-on. Want to allow campers to make reservations without a payment? No problem. Simply enable “Cash on arrival” in the payment settings and that’s it. 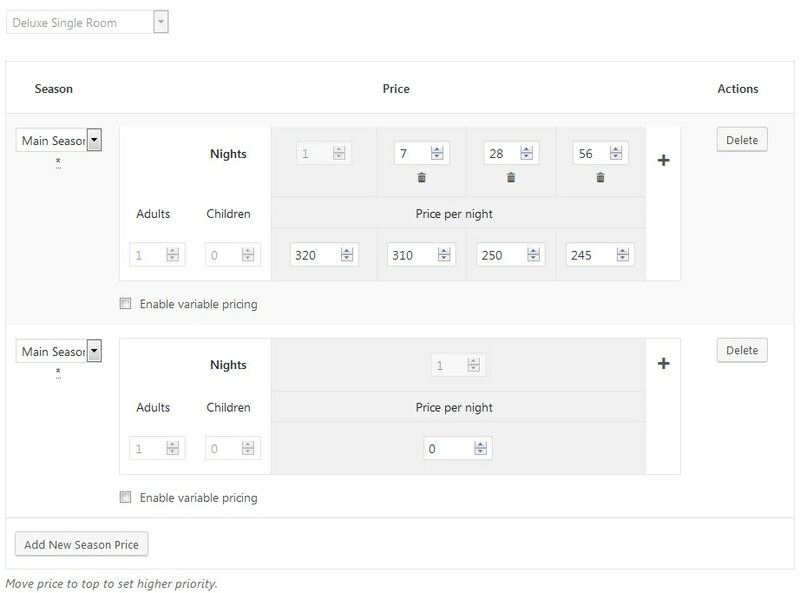 If you are not going to use booking services at all, you’ll need to click a button in the admin settings to hide all reservation-related functionality. That will let you have a simple camp brochure website with the campsite units that can be booked by phone, for example. Also, you can completely remove the section with rental units if there are no places for rent. The system is hugely flexible and can be adapted to any needs. Parallax scrolling effect used in the “Stats” section aims to provoke more emotion from people. That’s another great way to build more credibility with your camp brand using some numbers. 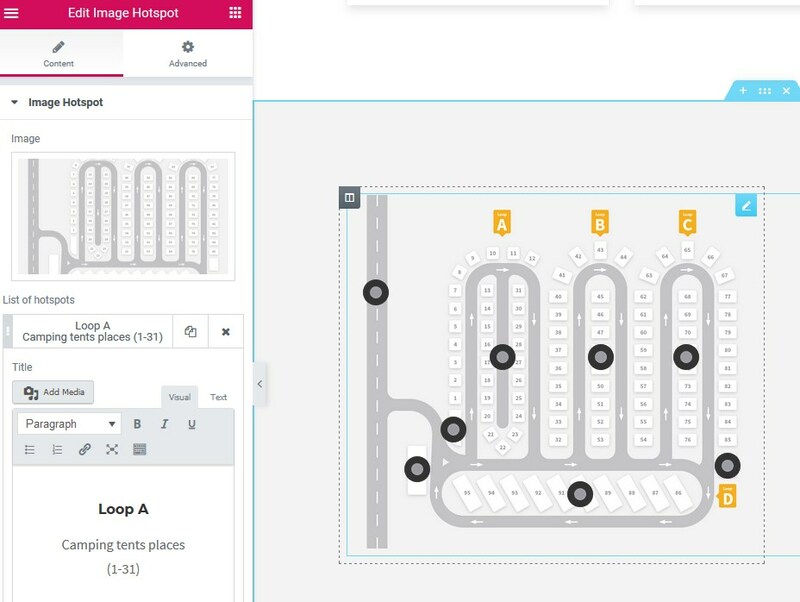 All numbers, icons and the image of this sections are editable in a matter of clicks via Elementor editor. Of course, you need to help campers understand what’s the easiest way to get around your camp and whether the location meets their needs. 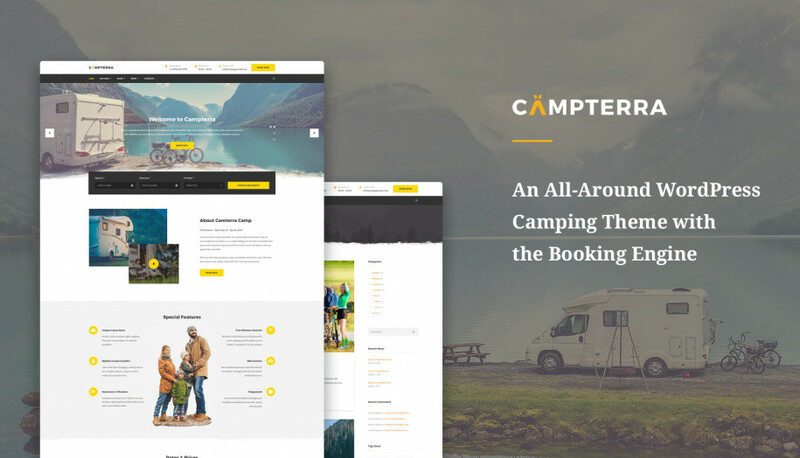 With Campterra camping WordPress template, you’ll be able to not only inform travelers about all location sites, but also entertain them with awesome animated markers. The map is added via the MotoPress hotspot add-on, integrated with the Elementor visual builder. Technically, you’ll simply need to add your map image and place interactive markers over it. If you feel like this design decision is not for you, you can simply upload your camp map image and feature it in a classic way without animation. The choice is yours. It’s necessary to show campsite surroundings, tell about all the things to do and share travel tips on the blog. You definitely want to prove that your campsite is the most extraordinary and engaging! You are armed with lots of pre-made tools for this purpose (integrated via Activities custom post type). Add photo galleries, videos and more to each story. Want to sell packaged tours or services with Campterra? Offer paid welcome hampers or charge for pets? 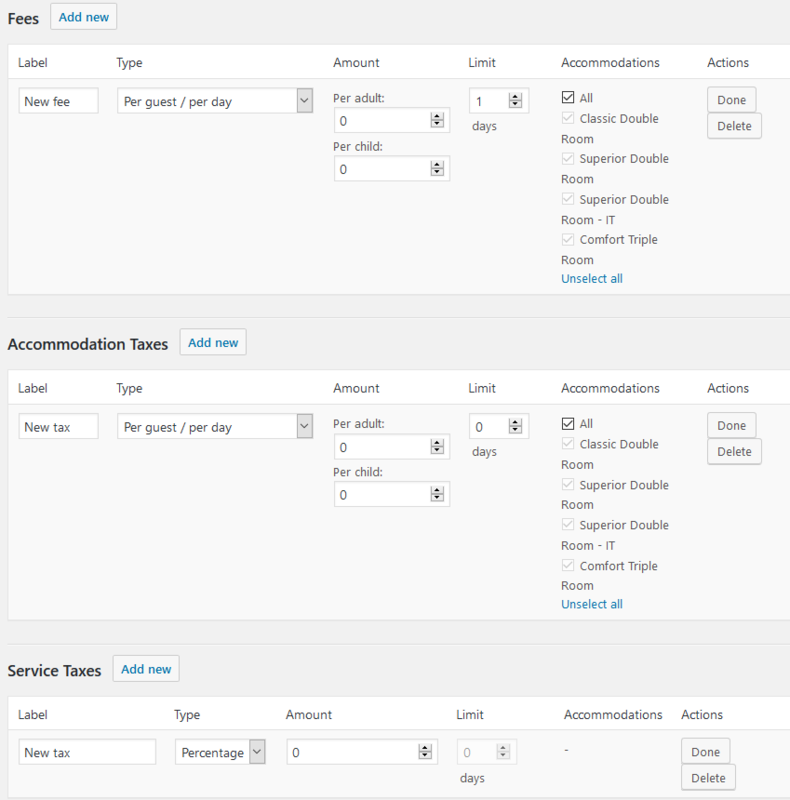 Upsell any number of extras using “Services” menu of the Hotel Booking plugin. It works as follows: you add any number of services or tours with descriptions and images, designate their pricing (select between per person/per unit and per day/once charge type) and assign the needed services to the applicable units/accommodations. Optionally on any website page since the whole list is added easily with a shortcode. Campers can view and read about all services and tours when surfing through your site. On the unit/property booking page (checkout). When the guests are booking a specific unit, they’ll be offered to add extras to their cart. A great way to increase the sum of every check, agree? For every business it’s important to grow an email list for marketing purposes, campgrounds are not an exception. Campterra allows you to collect email addresses via Mailchimp email marketing service. It’s easily integrated via the Another Mailchimp widget plugin by MotoPress. Offer something valuable within this call-to-action section and campers won’t think too much before leaving their email address! To get things connected, you need to add an API key of your valid Mailchimp account. Positive testimonials from other campers are 50% of your success. For deploying social proof, you’ll need to fill in the “Testimonials” custom post type. Add real reviews along with real photos of your loyal campers and earn credibility of your prospects! You can place testimonials with a shortcode on any page you need. Share your story, the history of your camp, tell more about team members, list prepared answers to common guest questions and more with the a pre-made About us page. The page is fully constructed with Elementor, which means you are the boss in terms of changing layouts, content blocks and updating data in per-designed sections. Manage your online reputation by showing your expertise and readiness to help. How easy is the theme customization? It’s a breeze. The magic and ease of visual editing is provided by the WordPress Customizer live editor and Elementor WordPress page builder. That means even non tech-inclined people are in good hands! Moreover, getting started with Campterra is also very easy since it’s supplied with the one-click demo data import feature. It’s going to help you figure out how to start playing with the theme edits. 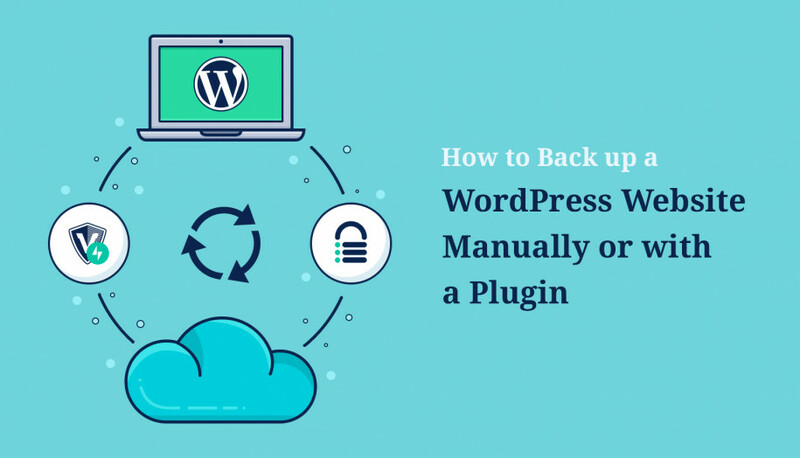 A while back, I’ve already explained how this WordPress reservation plugin operates in some cases, but those features are certainly just a small piece of the system. This extraordinary plugin is the core powerhouse of Campterra (and it comes free saving you a good chunk of money). By the way, if you’ve already chosen a nice camping theme and looking for an online booking system only, this plugin can be easily integrated with any theme, so search no more. Add and categorize rental units of your camp with all amenities and services. Display real-time availability calendars for each unit. Accept and file all bookings (including client and billing details). Add mandatory tax and free charges to each invoice. Maintain regular and flexible rates (set different prices based on a season, a number of campers or number of nights booked, amenities availability, etc.) – the process is automatic. Create and provide guests with personal discounts (percentage and fixed prices are available). 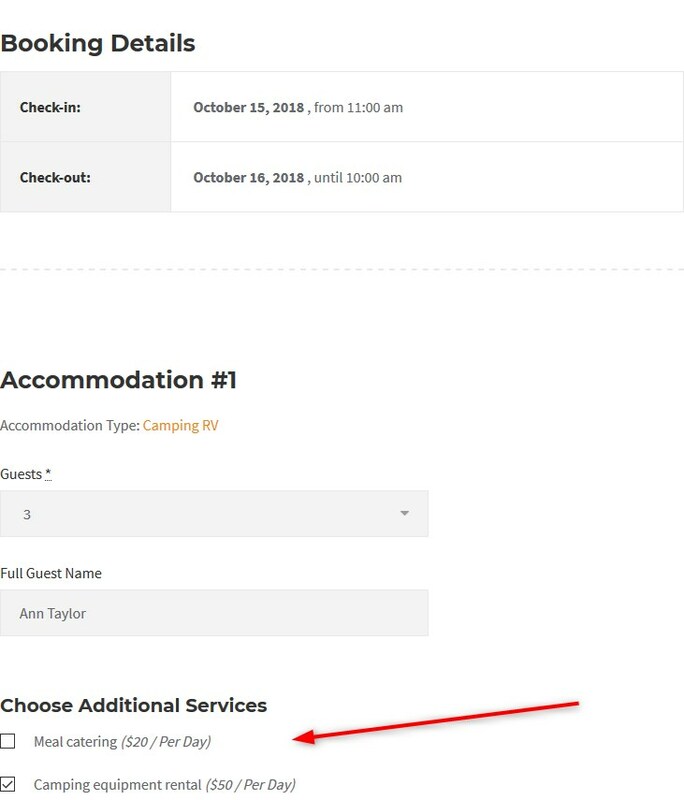 Enable iCal sync – a feature that allows you to synchronize direct campground bookings with those that may be submitted via third-party websites where your campground units are also listed. To set up the connection, the middleman website should support iCalendar file format. Providers like AirBnB, HomeAway, Canopy&Stars, FlipKey support iCal integration. And these are just major features. By the way, the plugin is available in 14 languages, so if are going to run a non-English website, we’ve got you covered as well! 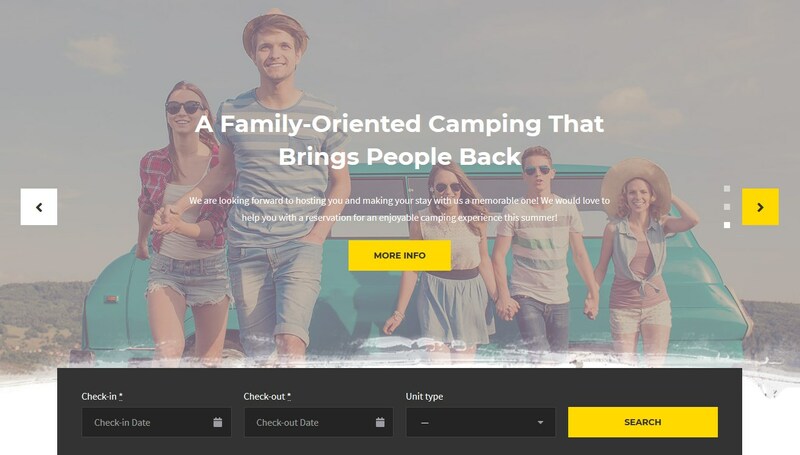 For just $59, you are the owner of a truly remarkable and powerful travel WordPress theme, which was created exclusively for campground and RV industry. Its professional and inspirational design communicates the idea that there is no place like your camp. In addition, Campterra offers you a premium online booking system by MotoPress built in for free – an easy way to set all your bookings on autopilot. What’s more important, the theme gives you all the tools modern campers are looking for – informative presentation of your sites and safe online reservations. Ready to create a better image of your business as an outdoor recreational professional? 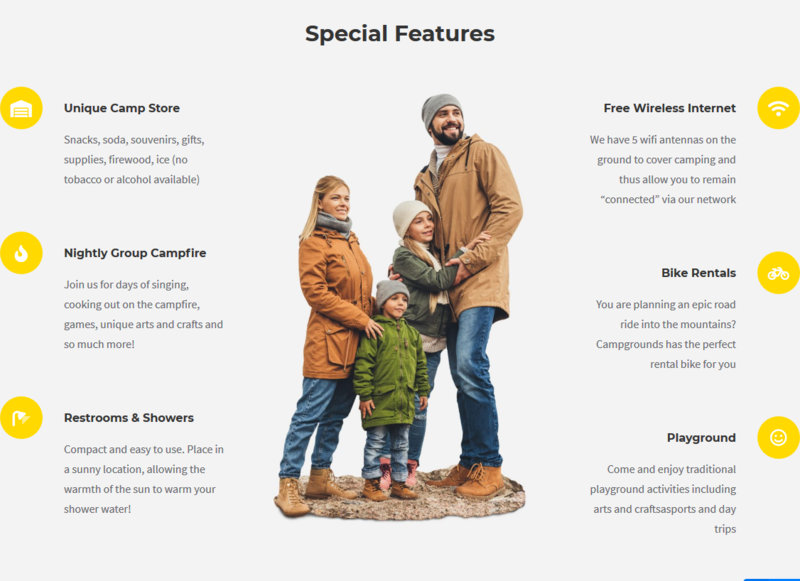 *Campterra Campground WordPress theme is available for free download and unlimited usage for all MotoPress Club members. thank you for such a detailed presentation, it seems this theme has all I need.